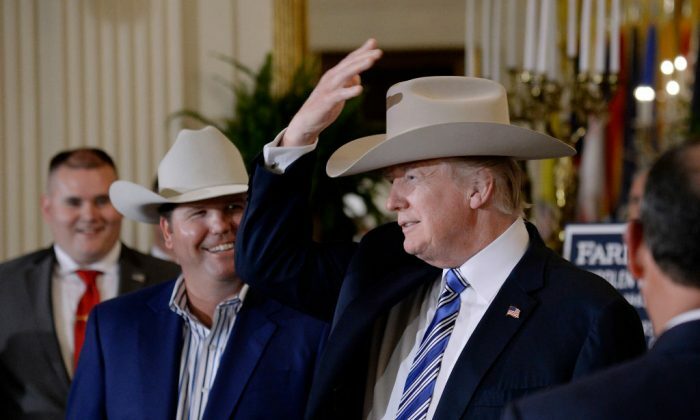 The President Donald Trump put on a custom-made hat from Stetson imprinted with his name. The Stetson company has been making hats for 152 years. It started in Philadelphia before moving into Texas. It is known for its high-quality cowboy hats. The picture of Trump in a cowboy hat has led to the usual uproar on social media. The hat was one of many products on display and filling the inside and outside of the White House for Made in America Week. The display is part of the president’s promises to bring manufacturing and jobs back to the United States. In his opening statements, the president mentioned that the United States already has agreements in place to supply beef to China. The president also sat in the driver’s seat of a fire truck and playfully pretended to be hunting down a fire. The truck was made by Pierce Manufacturing in Wisconsin. It sat on the White House lawn along with construction vehicles, helicopters, boats, and other American-made vehicles. Each of the 50 states had products on display from a company that manufactures inside the country. Georgia was represented by Chick-fil-A fast food; Alaska, by traditional wooden bowls; and New York by Steinway & Sons pianos. The White House posted a complete list of all the American products and companies it hosted online. Trump also talked about the progress that has been made in many aspects to rebuild the American economy. He mentioned the turnaround that this effort is a part of. Made in America Week goes from July 16 to July 22.